During July 19-22, Prof. Jin and his research group staffs attended the 8th Global Chinese Chemical Engineering Symposium (GCCES2016) in Singapore. 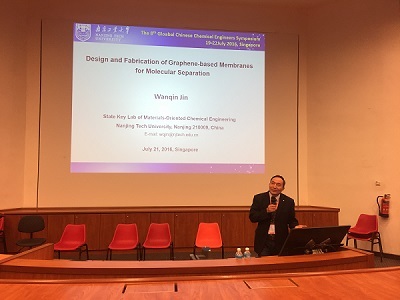 Prof. Jin was invited as one of the chairs of “Membrane Technology” session, giving an invited lecture titled “Design and Fabrication of Graphene-based Membranes for Molecular Separation”. 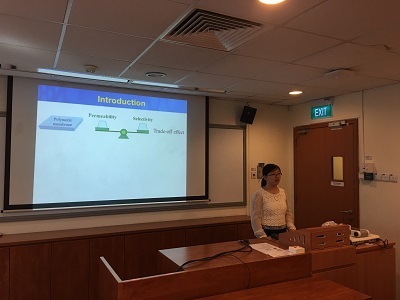 Dr. Zhao gave an oral presentation of “Constructing High-Efficiency Mass Transfer Channels in Polymeric Matrix via Graphene Oxide-Based Materials”. During this meeting, Prof. Jin and Dr. Zhao visited the Membrane Technology Centre in Nanyang Technological University, and had an in-depth communication with the leader of the Centre. Prof. Jin was giving an invited lecture. Dr. Zhao was giving an oral presentation.